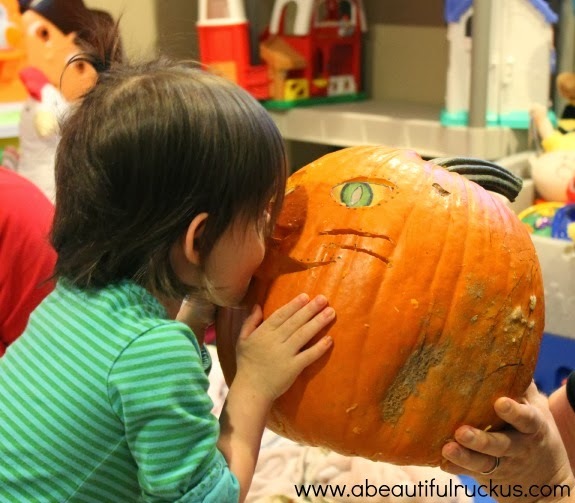 A Beautiful Ruckus: Pumpkin Carving Memories + A Giveaway! 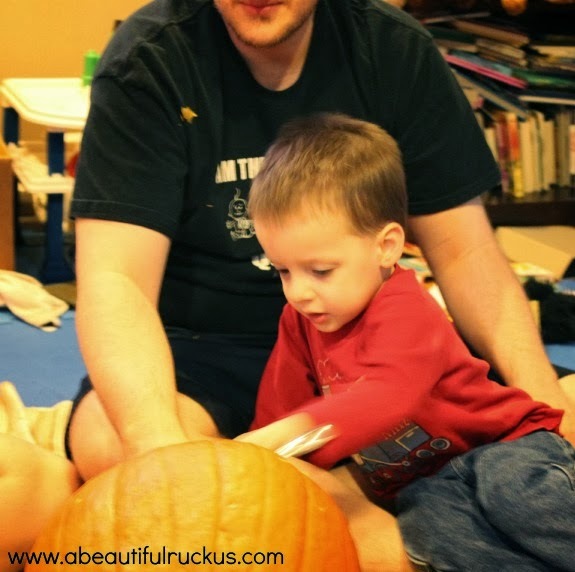 Pumpkin Carving Memories + A Giveaway! Last year, our kids were too little to carve pumpkins. But this year is different! 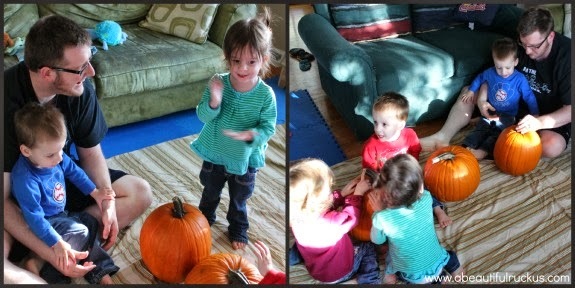 Since they are older, we got to make our first pumpkin carving memories! We decided to carve two pumpkins. With so many little kids, it was actually easier than trying to let them all crowd around one. Since we were using Pumpkin Masters Kits, I looked through them to find some patterns that the kids might like. We ended up with The Owl pattern from the Surface Carving Kit, and The Kitty Cat from the Kids' Carving Kit. 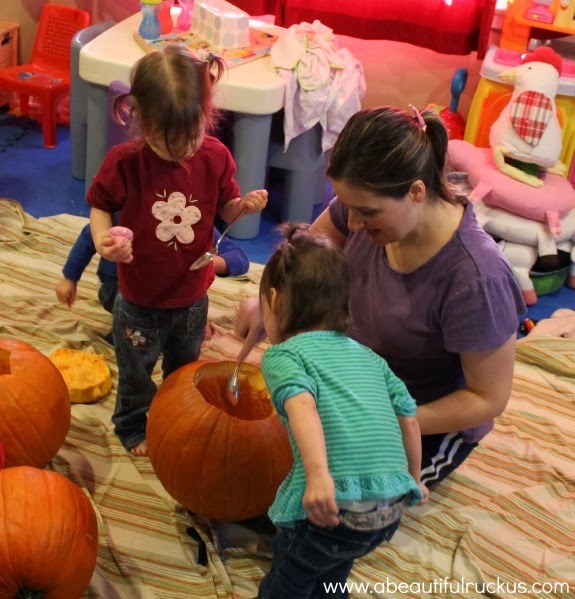 Once the kids finished their turns with the pumpkins, Daddy and Mommy finished scooping them out with pumpkin scrapers that came with the kits. I was actually surprised how well the pumpkin scraper/scooper worked! I'm used to fighting seeds with a spoon, so this was a nice, easy change. 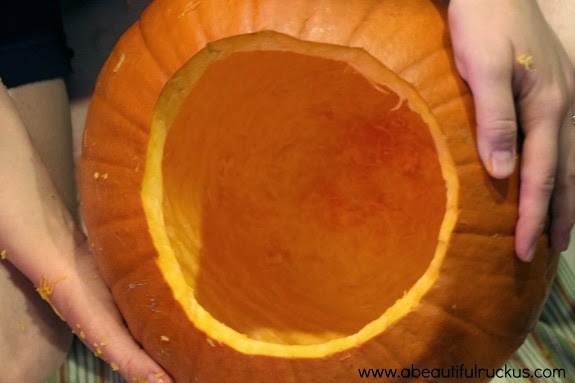 As a side note, if you decide to use the Pumpkin Masters Kits, and the directions call for the pumpkin to have the rind scraped down to less than an inch, don't fudge on it. There may have been a third pumpkin that met an early demise when we didn't follow the directions. Lesson learned for next year! The two pumpkins we did successfully follow directions on turned out really cute! 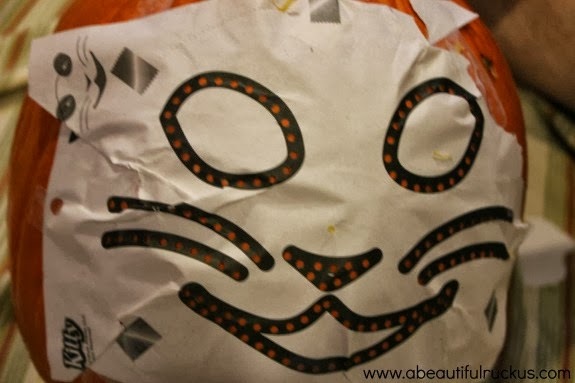 The Kitty Kat was super simple: Tape the pattern to the pumpkin, use a crayon to fill in the holes, remove pattern, use the special non-knife pumpkin carver to follow the pattern, insert eyes, and voila! A Kitty Cat! Okay, honestly, I wanted to carve The Owl for myself. I love the look of surface carved pumpkins, and really wanted to see how hard it was. Not bad at all! 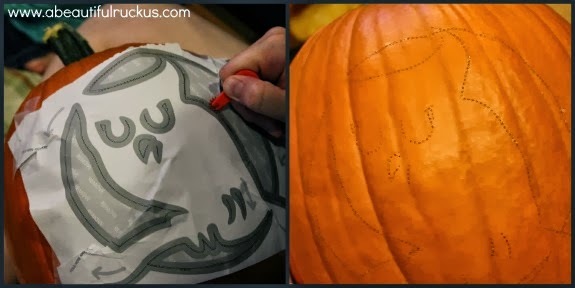 Trace the pattern with the pumpkin tool, remove the pattern, and carve away the rind as marked. With the special tools, it was really easy and fun! And thank goodness it was easy, because the kids were "helping" us the whole time! They do an awesome job doubling the time it takes to do any project...but hey, that's where the memories are made, right? And clearly, they loved doing it! How much did they love it? So much that Ellie was giving her Kitty Cat kisses! And this is how they turned out! What do you think?? Pumpkin Masters Kits can be found in your local grocery, drug, and craft store, along with Target and Walmart. They are super inexpensive (They are about $5 in my area! 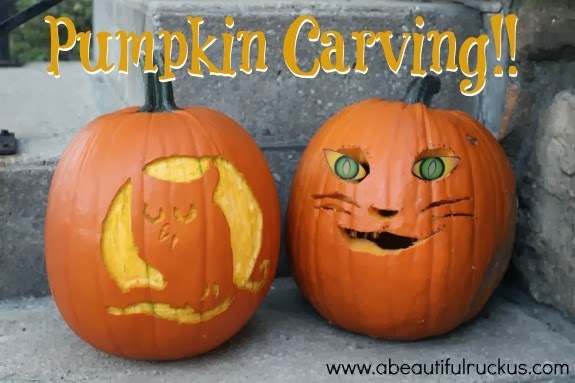 ), and make some very neat family pumpkins! Also, Pumpkin Masters is giving away six prizes, including $5000 for the best pumpkin carving. If you grab a kit, and carve a pumpkin, make sure you share a pic of your carving via Instagram or Twitter with #PumpkinMasters2013, submit via the Facebook app or send via email to: social@pumpkinmasters.com by October 31st for your chance to win! Official contest rules can be found here! Pumpkin Masters is sending one A Beautiful Ruckus reader their kits to design awesome Halloween pumpkins this year! Please note that due to how quickly Halloween is approaching, this is a 48 hour giveaway. Don't put off entering! Please use the Rafflecopter widget below to enter. The first two tasks are not optional and must be completed to qualify for this giveaway. The additional entry tasks are optional. Winning entries will be validated prior to announcing the winner with an alternate drawn if the entries cannot be verified. The contest ends at 11:59pm on Sunday, October 20th. The winner(s) will be randomly chosen and contacted by email on Monday, October 21st. The winner(s) will have 24 hours to respond to the email with their information so that the prize can be forwarded to them. A Beautiful Ruckus is not responsible for the delivery of the prize and is not responsible if the sponsor does not deliver. This giveaway is open to residents of the United States. 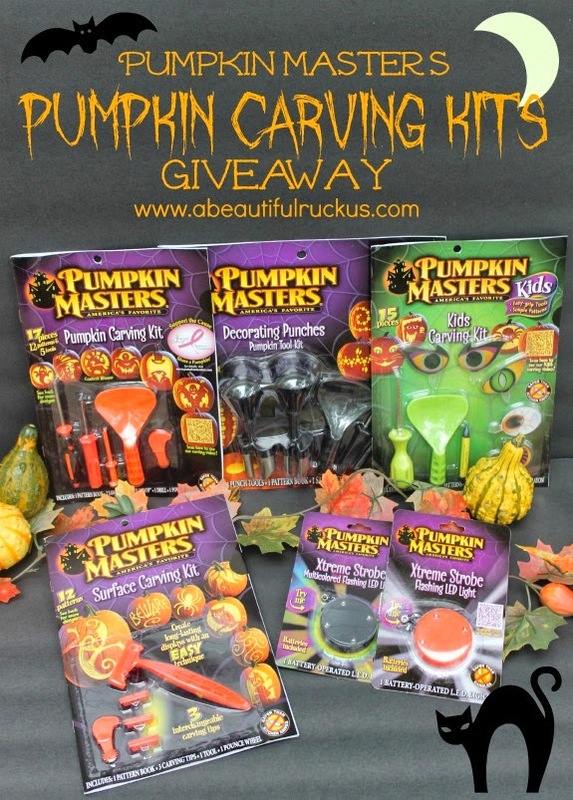 A Beautiful Ruckus received complimentary item(s) for review in exchange for hosting this giveaway from Pumpkin Masters Kits. I was selected for this opportunity as a member of Clever Girls Collective and the content and opinions expressed here are all my own. For more info, please see my disclaimer page. I have used these kits for years! I lik . ghosts and witxhes. Jamie T.
I have a Barbie one, and I made Barbie bats with hearts at the center. I would love to have that pattern again. I want to make a fun swirly fun design! I've been thinking about actually carving pumpkins w/ Isabelle this year. This would be great! I would love to do a frankenstein pumpkin! I really want to do a Jayhawk pumpkin (stencils at funstuff.ku.edu!) but I'm also really interested in trying out this carving kit. I've seen it in several stores! Our family has voted for a monster with really big teeth! I would want to put a design on that my boys like. They are really interested in trains, cars and airplanes. So, maybe Thomas or Lightening McQueen. I would carve a cross in it since I dont celebrate Halloween. I like doing a design with multiple pumpkins, like last year I made a tower of 3 pumpkins with the letters B-O-O (one on each pumpkin), it turned out really cute. My grandkids would pick either something from Star Wars or a Princess! Probably an owl, my daughter is all about them! We might like an Owl design. I want to do an Iron Man pumpkin! I think I'd just do polka dot! Since my three kids are all under 4, I'll be happy with whatever we are able to carve on a pumpkin! This will be our first year letting them actually try to carve! I want to do pac man eating a ghost but I am not letting the 4 year olds carve anything. Brave people! I'm glad the kids loved it! !